Discover the top 6 Security Awareness Training platforms. Examine their features, quality of training materials and reporting. Security Awareness Training (SAT) is a crucial tool to protect your business against attacks. Your business likely has strong cyber defences. However, human error is the weak link which threatens your network, and there’s no technology to stop that totally. SAT is a top way for businesses to tackle this threat. SAT platforms send out simulated phishing campaigns to test employees. They then offer a range of interactive training materials. These help to educate people to become more security aware. Some vendors may also offer Outlook plugins to help people report phishing attempts. If you want to read to read more about why you need Security Awareness Training check out our blog post about why it’s important. To help you find the right product, here’s Expert Insights’ list of the top Security Awareness Training. We’ll discuss the quality of their phishing simulations, how easy they are to manage, how good the reporting is, and the quality of the training materials. KnowBe4 offer both free and paid for training tools and simulated phishing campaigns. The service is easy to install and is hugely effective at increasing the overall security of a business. It does this by training users to identify and avoid phishing attacks. KnowBe4 is very popular with clients, who enjoy their interactive training content. This consists of videos, games and guides. Admins like the service for its detailed reports. These demonstrate how well individuals are performing when tested. One of the best things about this service is that it provides an Outlook Plugin. This allows end users to report emails they suspect to be phishing attempts straight to IT departments. This helps IT know who is security aware. It also helps them to stop threats before they can trick someone less aware within the network. This Plug-In greatly reduces the number of people who will actually fall for a phishing attempt. KnowBe4 is a market leading platform we recommend to businesses of all sizes. We particularly recommend this platform to American organisations, as KnowBe4 is a US based company. You can read Expert Insights’ complete review of KnowBe4 here. Cofense has a focus on making employees safer against threats by offering software solutions. These include automated phishing responses to help protect businesses from attack. They offer a range of simulated phishing campaigns. These effectively help to identify people who need awareness training. They are flexible, and you can set the difficulty level. You can also target them at different groups. They offer an Outlook plugin, with support on mobiles. Cofense offers a great range of training content and reports. These will help you to measure how your company security improves. Cofense is very popular among its users. Many clients praise the flexible phishing campaigns. The Triage feature is also popular. This sorts employee phishing responses together. This means admins are not bombarded with emails when they run a phishing campaign, or when the business is hit with an email scam. As an advanced service, Cofense is suitable for mid-sized to large companies. However, they do offer a free version of their platform to companies with under 500 employees. You can read our full review of Cofense here. Wombat Security offers a range of testing and training that goes beyond email. Aas well as email campaigns, they offer infected USB simulations, SMS threat simulations and more. Wombat offer 35 interactive training modules with a wide variety of content. This includes games, guides, newsletters and video. This is the jewel in Wombat’s crown. The material is popular with users, who enjoy taking part in the training. They also find it easy to understand. This is a big benefit of Wombat’s service. Connecting with employees is half the battle in making them more security aware. Wombat is popular with admins because it offers good reporting. In addition, it’s very easy to deploy. Wombat has a managed option, where they will set up the simulated campaigns for businesses to help them get more aware faster, without taking up too much time. You can read our full review of Wombat Security here. Barracuda offers a security awareness training product which is has a great focus on data analytics and reporting. This makes it a great choice if your organisation needs staff trained to a certain level for legal compliance reasons. Barracuda gives companies great insights into who is security aware and who needs training. They use simulated campaigns to collect a wealth of data on employees. They then offer a range of objective-based metrics so you can set targets to help your organisation become more secure. Using this data, Barracuda can see specific areas where individual users need help. Some customers argue that the training offered could be enhanced. However, the service offers good value for money and presents good metrics for success. This service is ideal if your organisation is looking for data and target orientated security awareness. It’s also easy to deploy and manage. You can read our complete review of Barracuda PhishLine here. PhishProof is a security awareness training which tests employees with phishing campaigns then helps them become more security aware. The training they offer is high quality and professional. The service is aimed at corporations, and the training on offer reflects this. It’s very professional but still engages employees. They offer a large range of materials which will help you become much more security aware. The training materials are mostly immersive quizzes and scenarios. You should know, however, that this corporate focus may not appeal to all audiences. PhishProof offer a useful set of metrics to show how your employees perform. They also offer a mobile app so that employees can continue training offline. We recommend PhishProof to larger companies needing a professional security awareness training platform. PhishProof’s pricing also likely suits their budgets more. However, the service does offer three training module options, Beginner, Fundamental and Advanced. This allows customers to pick the module that best fits their needs. You can read our full review of PhishProof here. Ninjio focusses on providing engaging content for users. They use great content to increase awareness across organisations. They offer interactive animations in a distinct style to help employees learn good security techniques. These cartoons have professional production values and are very impressive. Unsurprisingly, they are very popular. Users find them very engaging. However, this style will not fit in with all company cultures. Ninjio’s focus on content means that there are fewer data reports and advanced testing options than some competitors offer. But, great content means that the training is easier to remember. This will help to increase your security. Ninjio is easy to roll out and easy to manage. They offer some of the best training materials in this market. Ninjio is a great option to engage your employees about security awareness. You can read our full review of Ninjio here. 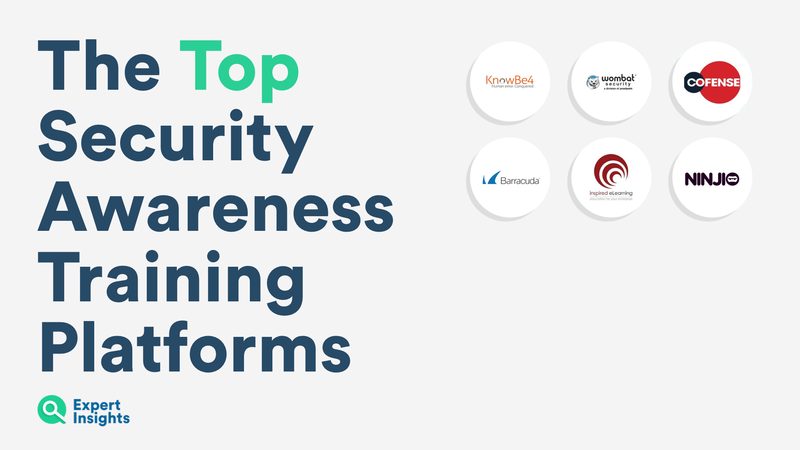 So there ends our list of the top 6 Security Awareness Training platforms. Each one brings unique features to the table, some offer amazing training materials, some offer a more corporate approach and some offer a focus on data analytics. Finding the one that best suits the needs of your business is crucial for you to improve your security.